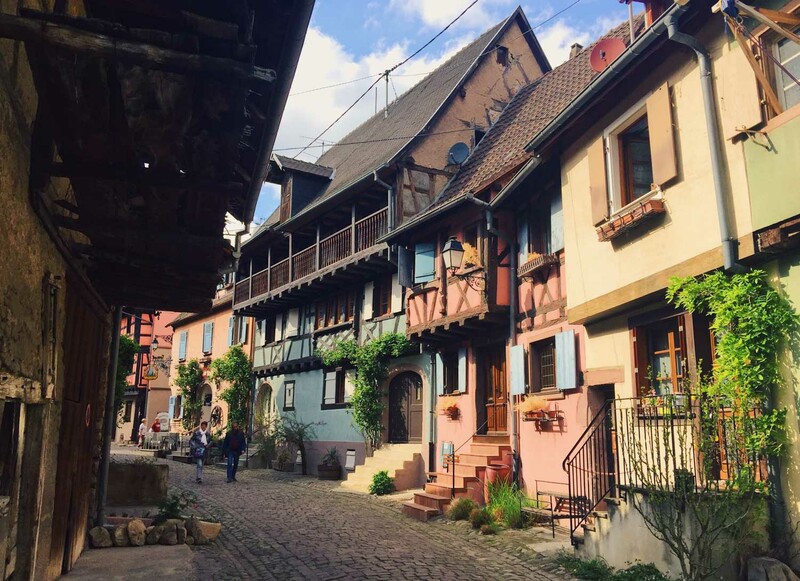 This was my first thought when arriving in the tiny village of Eguisheum, just down the road from the equally charming town of Colmar in France. 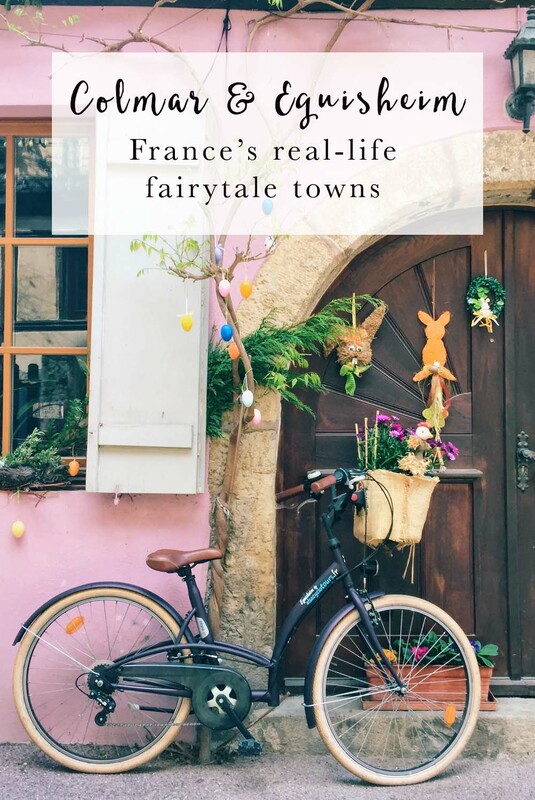 With cobbled streets, candy-coloured houses and wooden beams, it was like stepping into a scene from the film I’d watched just a week before. I half expected Belle to appear and the whole street to burst into song. It was a fairytale bought to life. 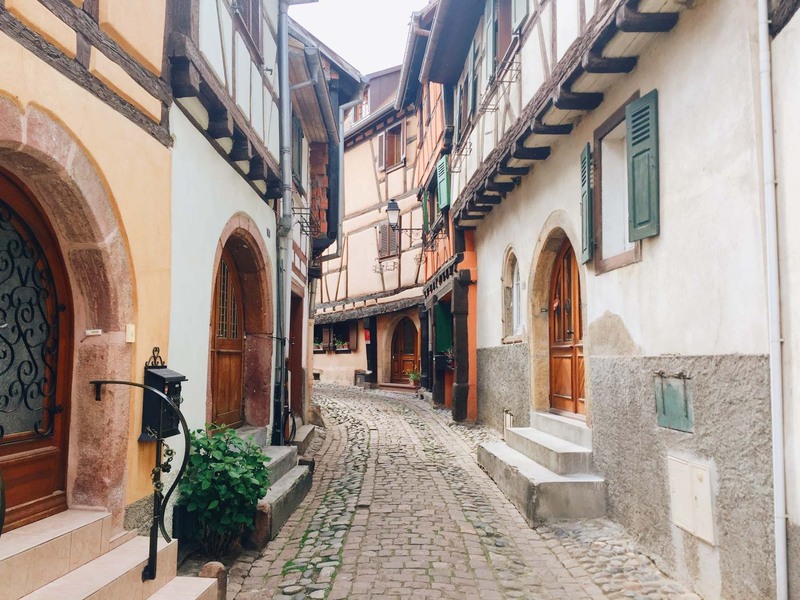 This post is all about why we loved Colmar and Eguisheim, plus a run-down of all the best things to do in Colmar. 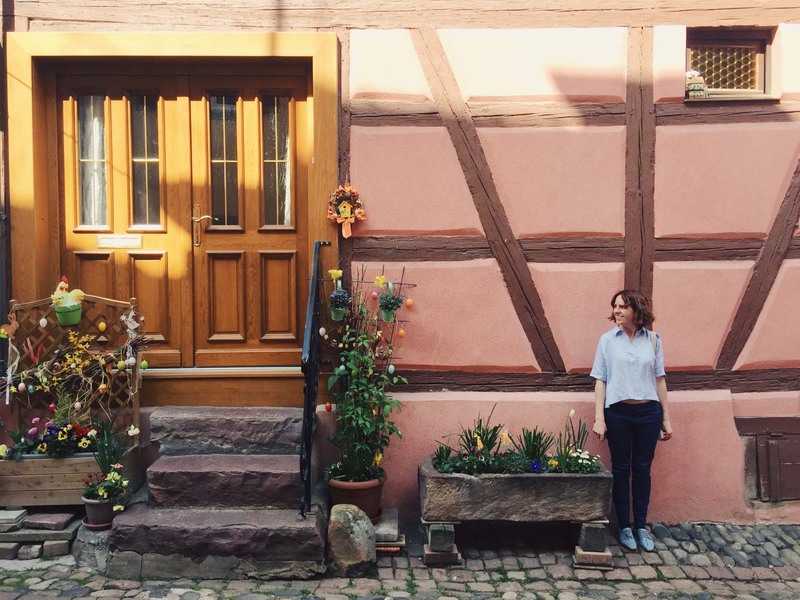 We were in Colmar for a couple of nights for the first stop on our road trip around France, Switzerland and Italy. 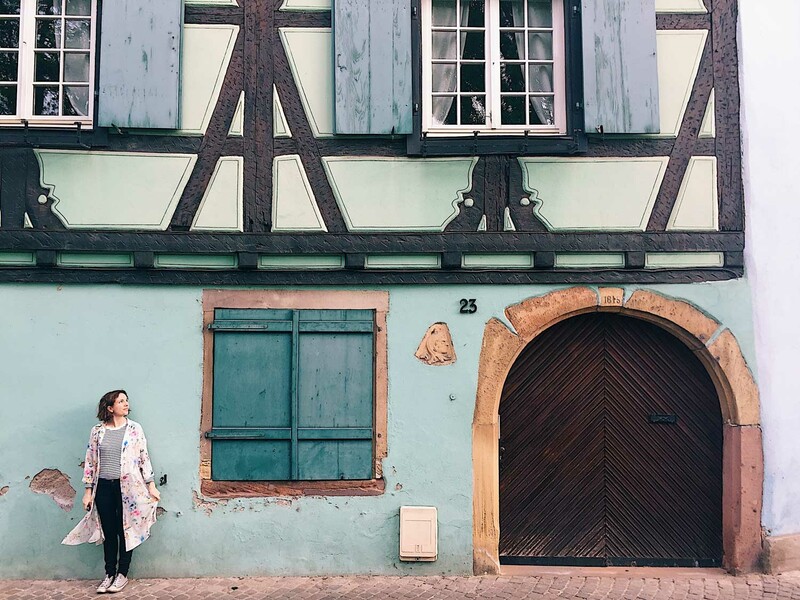 The whole two weeks turned out to be the most colourful road trip we’ve ever taken in Europe, and Colmar set the tone perfectly, with rainbow buildings and cute sights galore. A canal runs through its centre and the town is often nicknamed ‘France’s Venice’. Indeed the most picturesque part of the town takes the name ‘Little Venice’, with pretty buildings lining the waterside. Although this is the most touristy part of town, it never felt crowded. 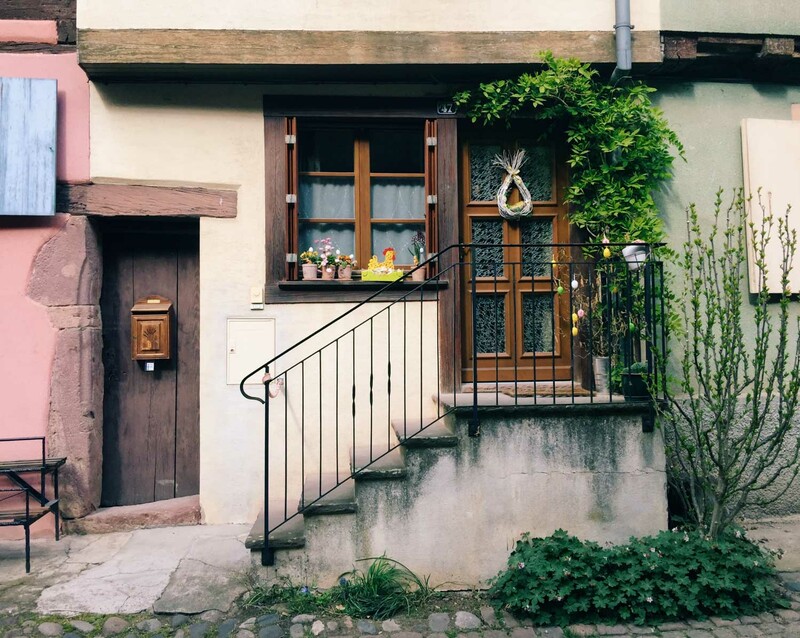 People take pride in their homes in Colmar and many are decorated with flower-filled window boxes, wisteria arches, and sometimes even chairs attached to the walls! We went in April at Easter-time, which made for an even prettier visit as the whole town was decorated in celebration, with trinket-filled displays forming bridges across the canal and Easter nests lining the windows. We read somehwhere that the colours of the houses reflect the jobs of the people that people used to live there: blue for fisherman, yellow for bakers, red for butchers, and pink for brothels, but we couldn’t verify that and I’m not sure it can be true as there was a pretty limited colour palette and it would have meant quite an extraordinary amount of brothels. But perhaps the colour coding is a thing of the past and nowadays people have free reign. Either way, I like the idea of it! 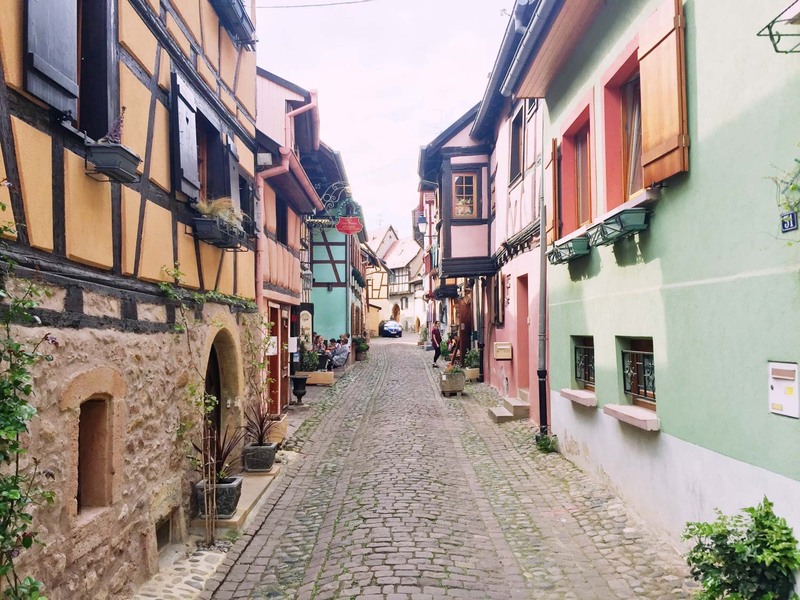 While Colmar was stunning, our trip to Eguisheim was even sweeter. 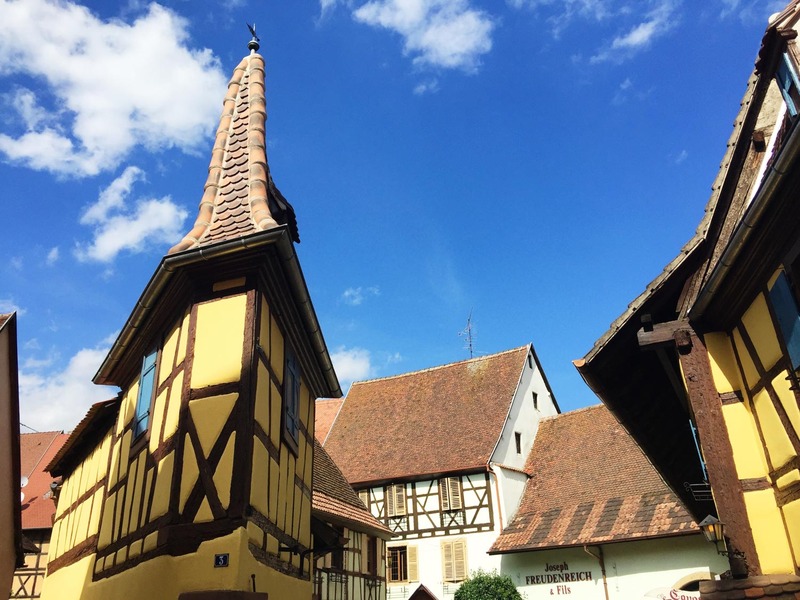 We hired bikes for the afternoon and cycled the 30-minute journey from Colmar to find a village that outdid itself in charm. It seemed every house had been decorated for Easter, with cute little baskets, eggs and chicks. 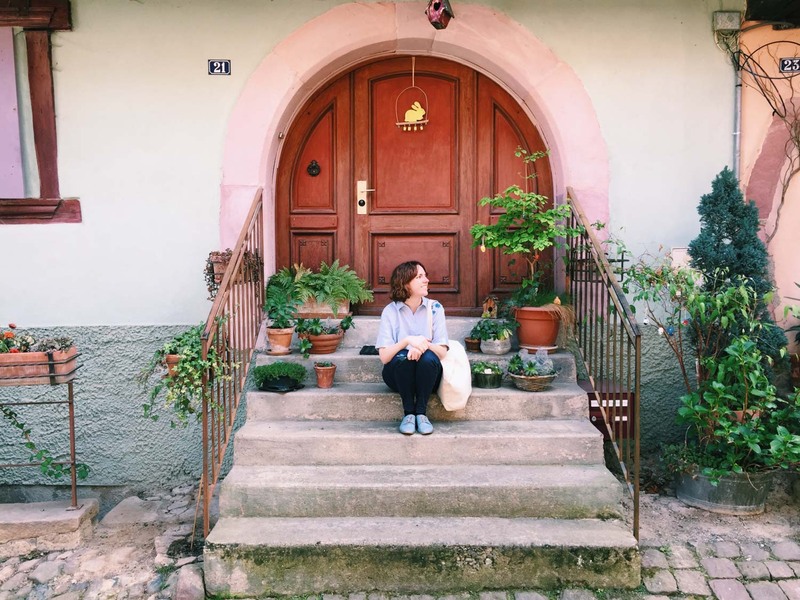 The village is arranged in two concentric streets around a central square and at every turn we found ourselves stopping and take yet another picture-perfect snap. 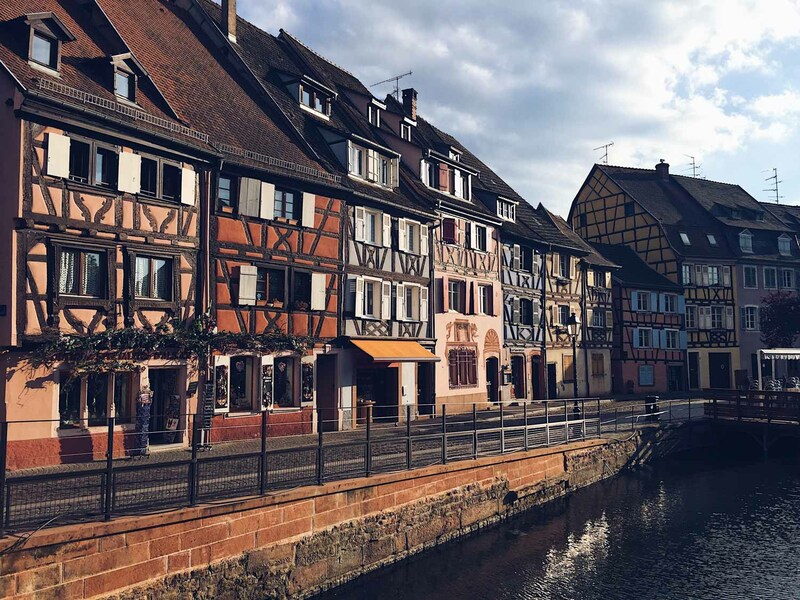 In fact, we did that during our time in both Equisheim and Colmar, so I’ve included lots of photos at the end of this post. 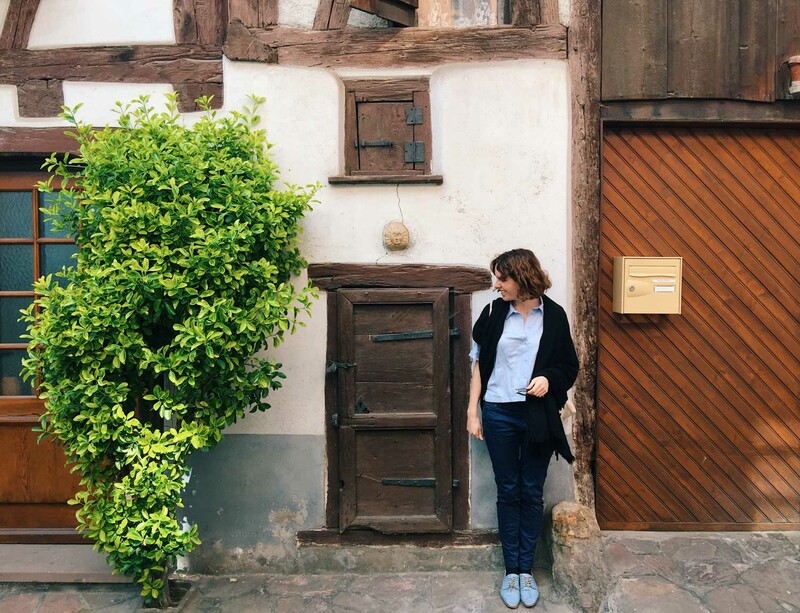 First, here are some ideas for things to do in Colmar and Eguisheim, France. 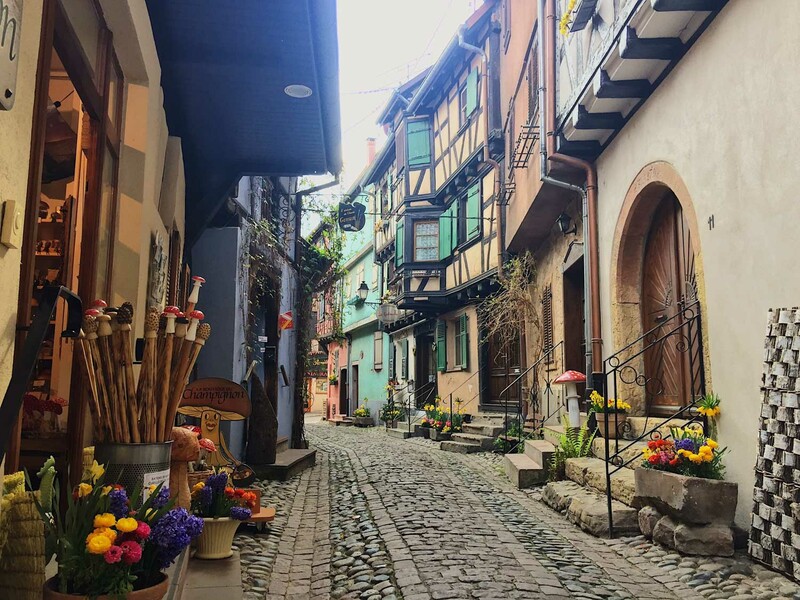 The number one thing to do with your time in Colmar and Eguisheim is to wander the pretty streets, taking it all in and stopping for lots of photos. It’s like an open-air museum. 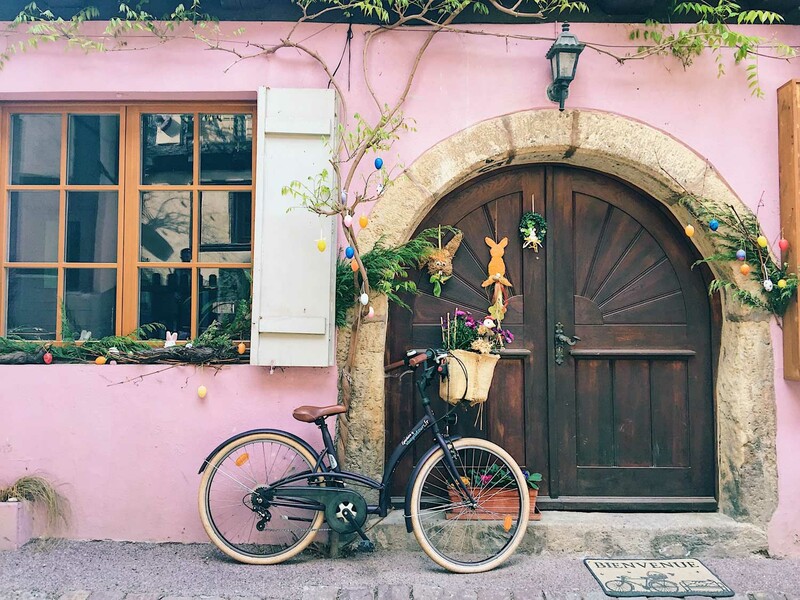 See the photos at the end of this post to get an idea of how lovely it all is. 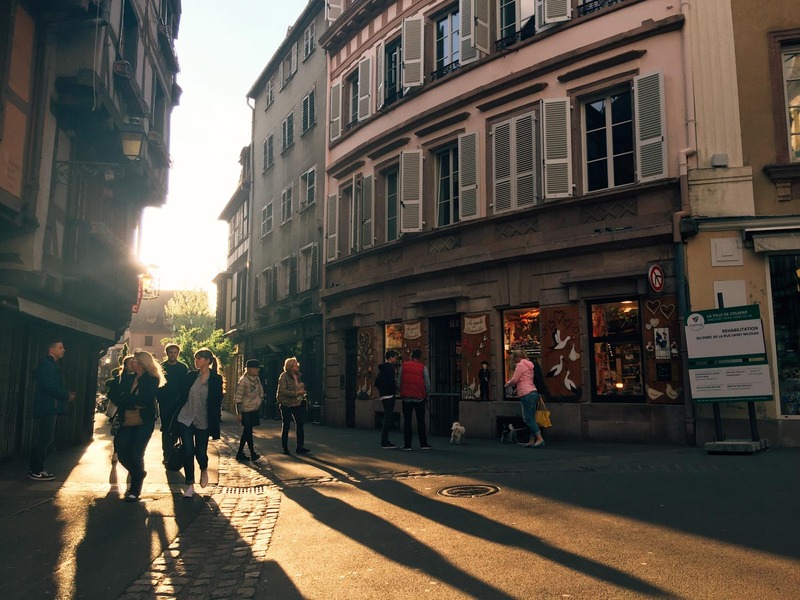 There’s a self-guided walking tours you can do that’s outlined on the official Colmar tourist map. 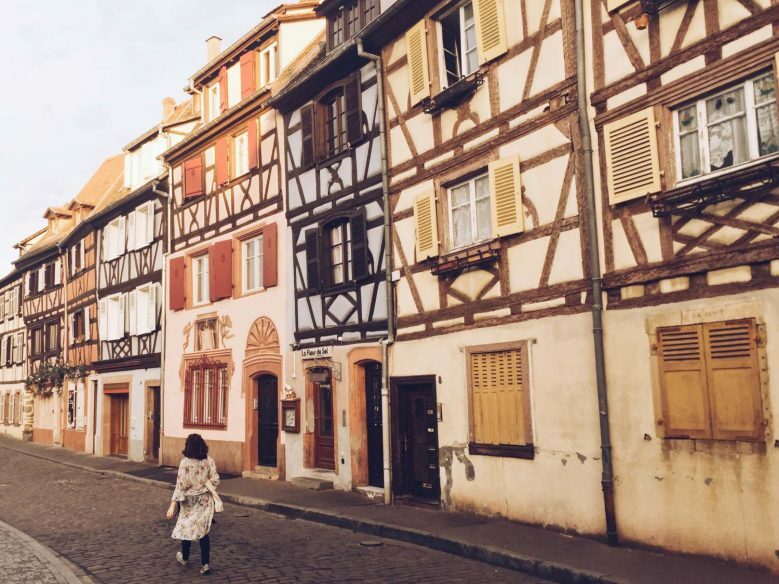 It’s also marked by golden triangles on the pavements that have the head of the Statue of Liberty on them (Colmar was the home of Batholdi who sculpted the Statue of Liberty). Highlights along the way include the House of Heads, the Customs House, Tanner’s District, Unterlinden Museum and Pfister House. 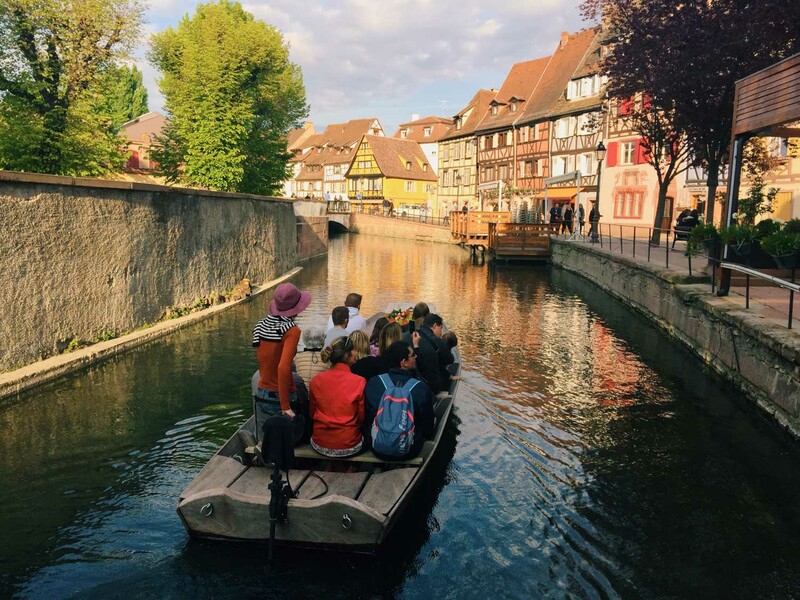 This route is filled with the best of what to do and see in Colmar. 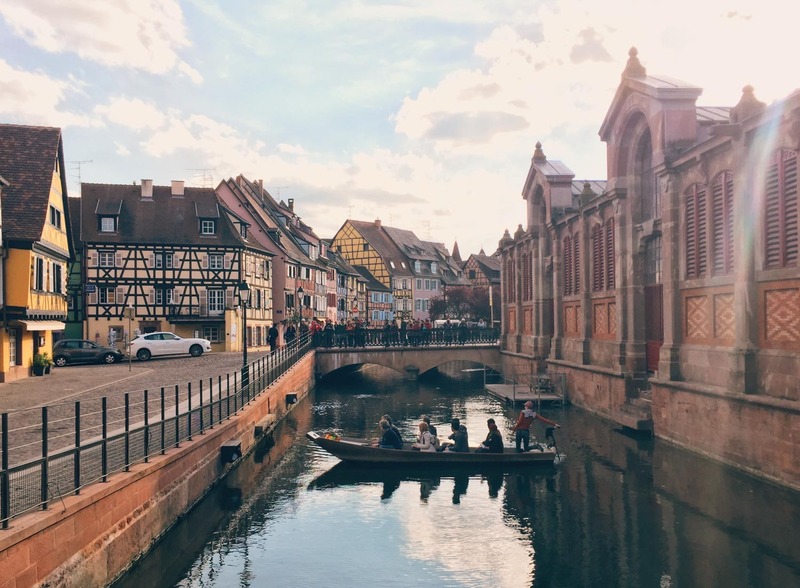 If you only see one area of Colmar, make it Little Venice, which concentrates all the different charms of Colmar – candy-coloured houses, canals and cobbled streets – into one little space. 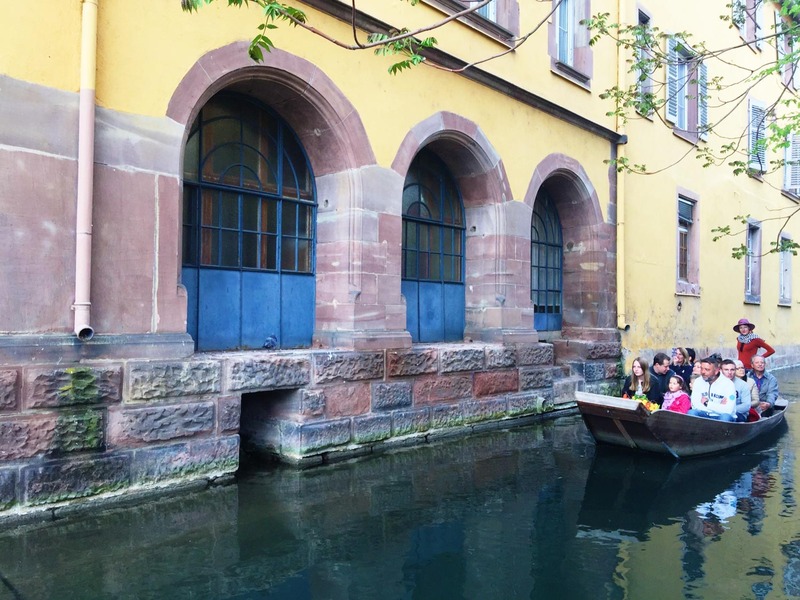 A quintessential Colmar thing to do is to take a boat trip along the canal where you can get a unique perspective of the town. Boats take around 7-9 people and board at Saint Pierre Bridge. A 30-minute cruise costs €6 per person. 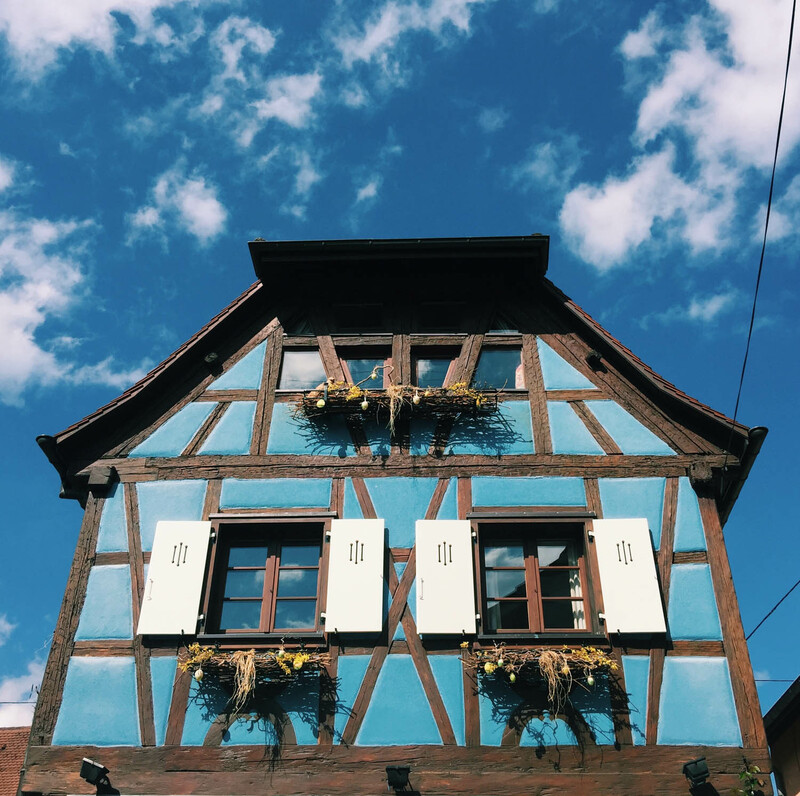 Colmar is filled with charming boutiques, selling everything from local delicacies to handmade arts and crafts. 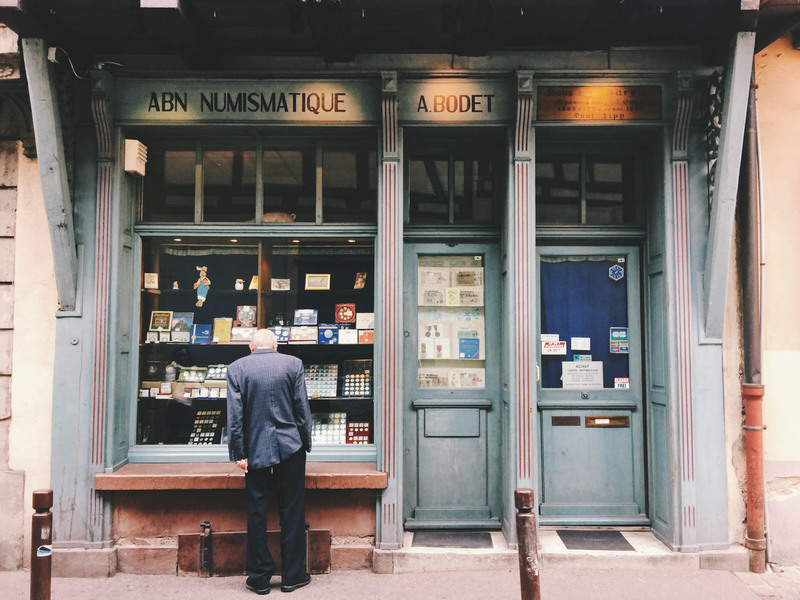 The shops are a pleasure to simply explore. 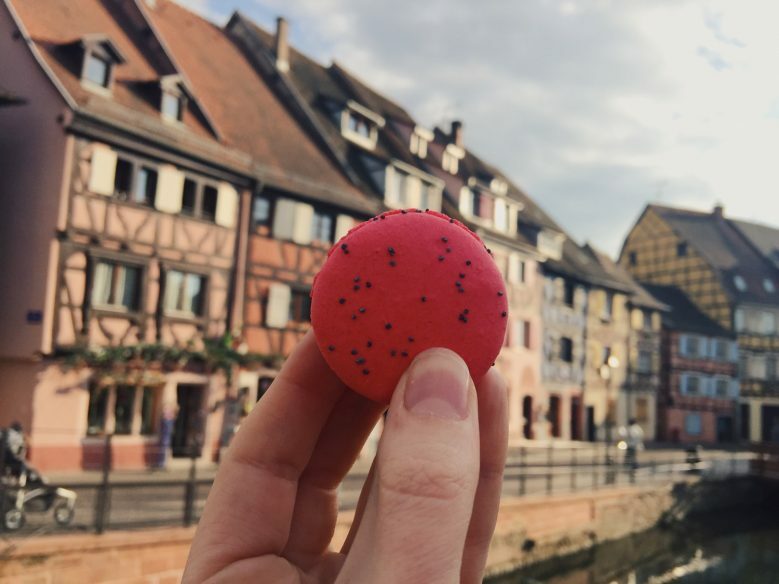 Colmar’s covered parket in the edge of little Venice is home to around 20 stalls selling a variety of delicious local produce, including cheese, olive oil and pastries. Some of the cafes in the market have outdoor seating, which is ideal in good weather. 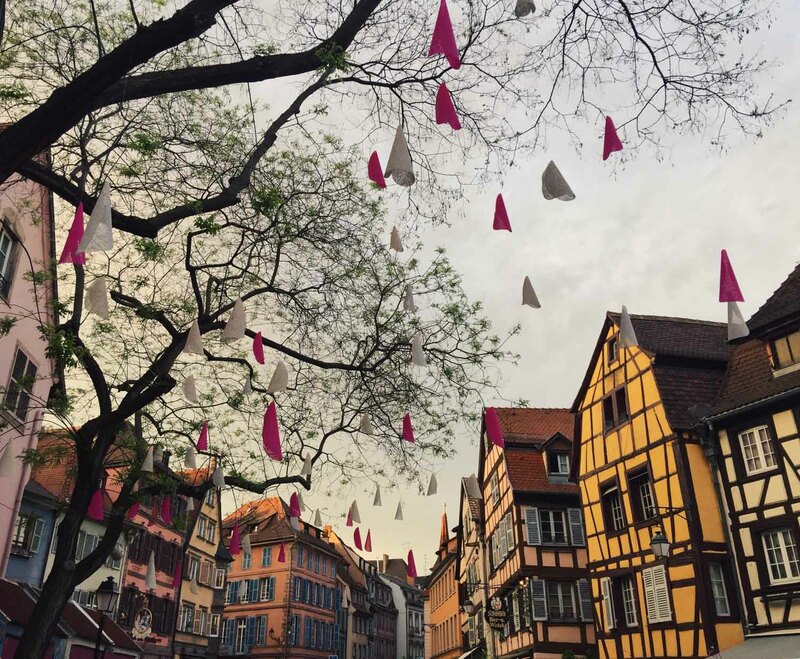 Colmar is specially lit at weekends and during festivals in a way that showcases and enhances the city’s architecture. The town has 1100 computer-driven colourful lights that they use to light the town in different ways throughout the year. You can see the lights on Fridays and Saturday, plus every evening during major events. 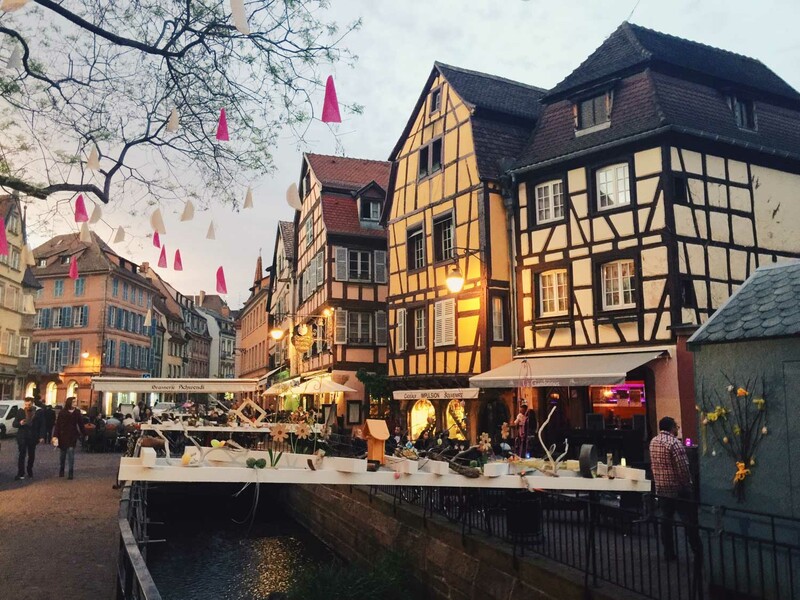 Colmar is the capital of of the Alsace wine region and is surrounded by vineyards. Sample wine in the many restaurants in town or follow part of the Alsatian wine route and visit vineyards and winemakers at their source. Most if the wine is white and on the sweet side, including Riesling, Muscat, Pinot Gris and Gewurztraminer. We particularly enjoyed trying wine at the atmospheric L’Un des Sens wine bar. There are some wineries in town, including Domaine Karcher, a family-run vineyard where you can do a guided tour and tasting. 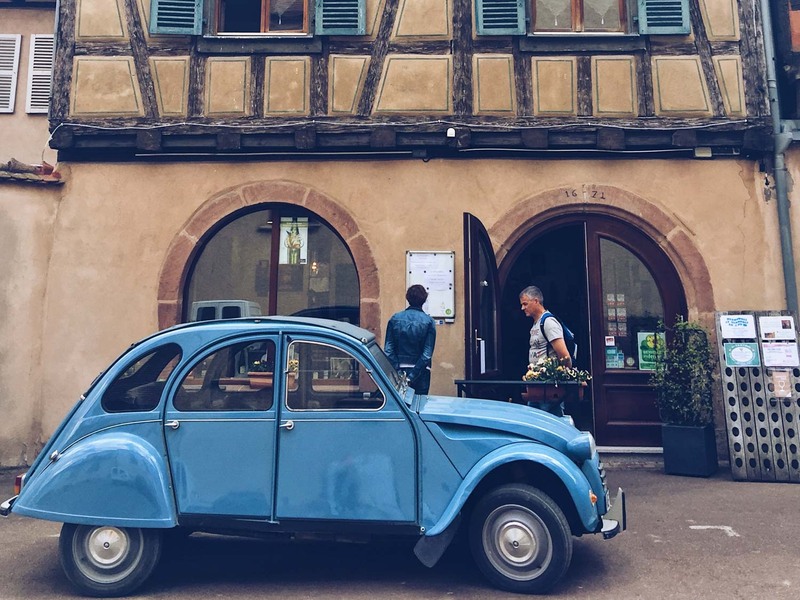 A fun way to explore the wine region on a day trip from Colmar is by travelling between some of the towns and enjoying the views of the vineyards. You can do that by car, bike or even on foot. 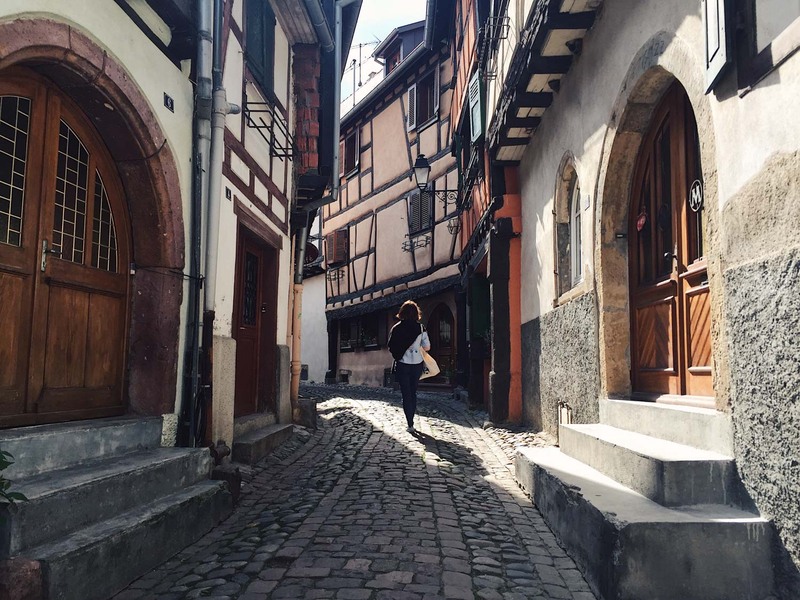 There’s a popular 5km path between the towns of Riquewihr, Hunawihr and Ribeauville. 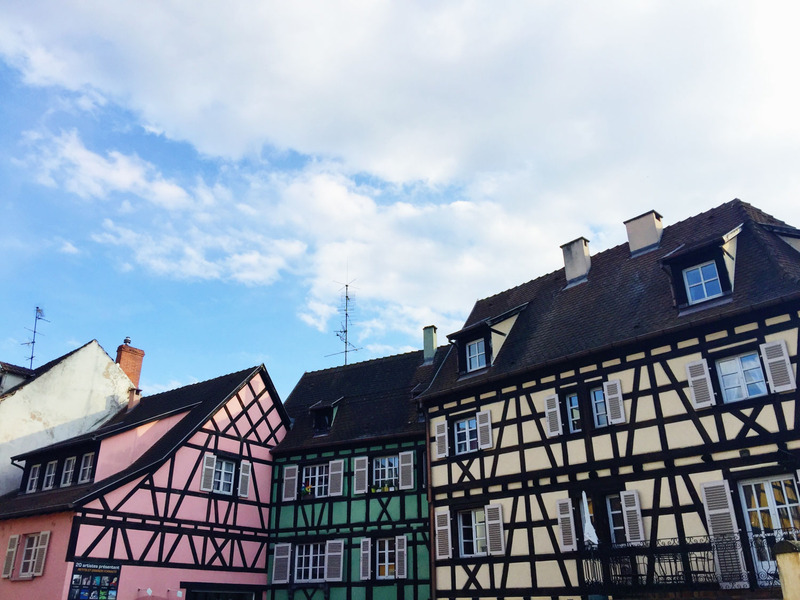 If you don’t have a car, you can get a bus to Riquewihr from Colmar and start the walk from there. 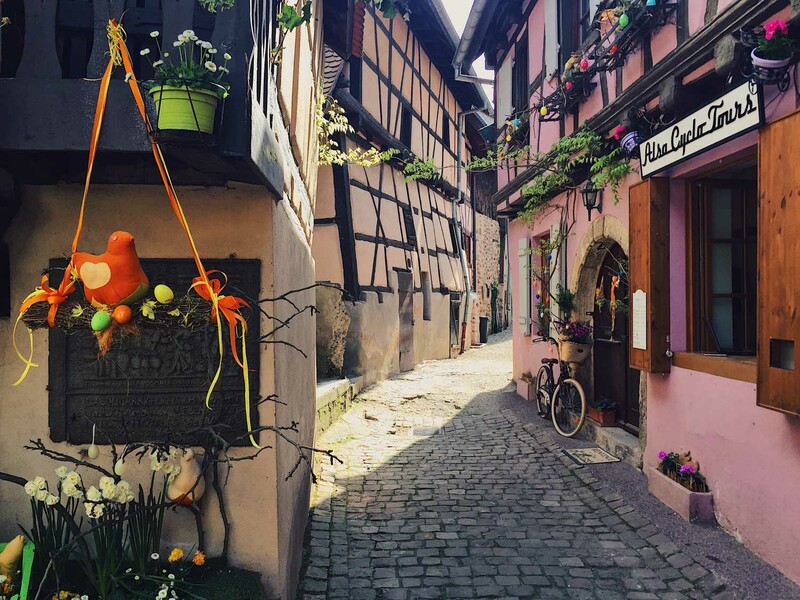 The route between Colmar and Eguisheim is part of the Alsace wine route. Often called Colmar Cathedral, but not technically a cathedral because of the size of its bishopric, St Martin’s Church is the biggest in Colmar. It’s one of the oldest buildings in town and a striking sight to see, topped with a colourful yellow, red and green roof. It is free to visit. 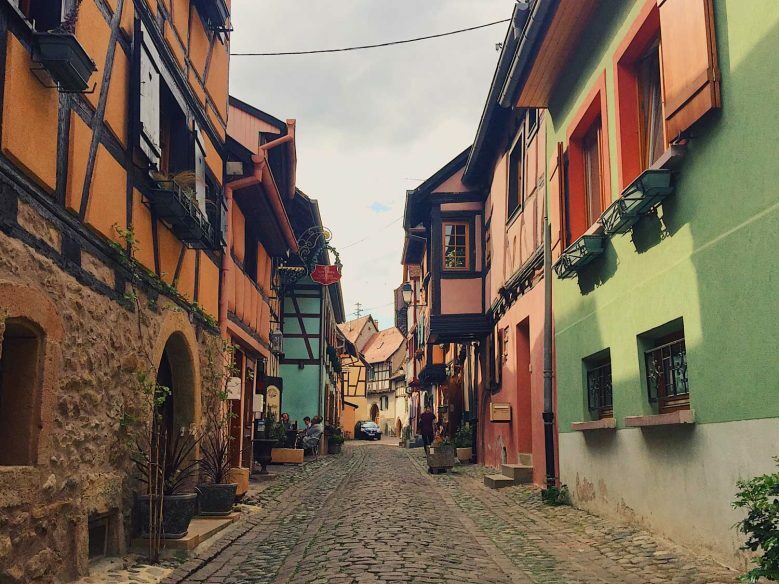 Eguisheim is 7km from Colmar. 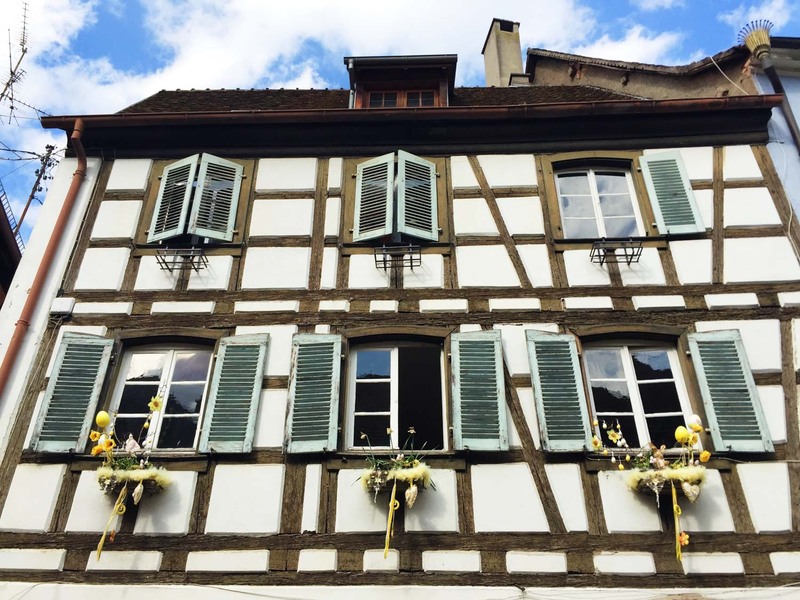 We cycled there along the Alsace wine route, which takes you along a busy main road before turning off to Equisheim. 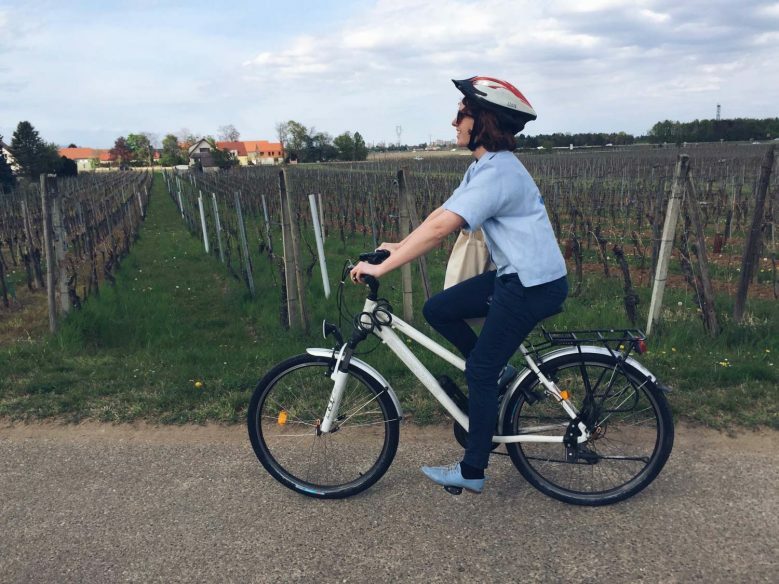 You get some views of the vineyards, but we much preferred the route we cycled home, which went along much quieter streets, alongside a river and through fields of vegetables and corn. Both routes took about 30 minutes, although the first one was slightly shorter. For a treat, stay at this centrally located 5-star hotel in a historic building. Rooms start at €250. Find the latest prices and book now. 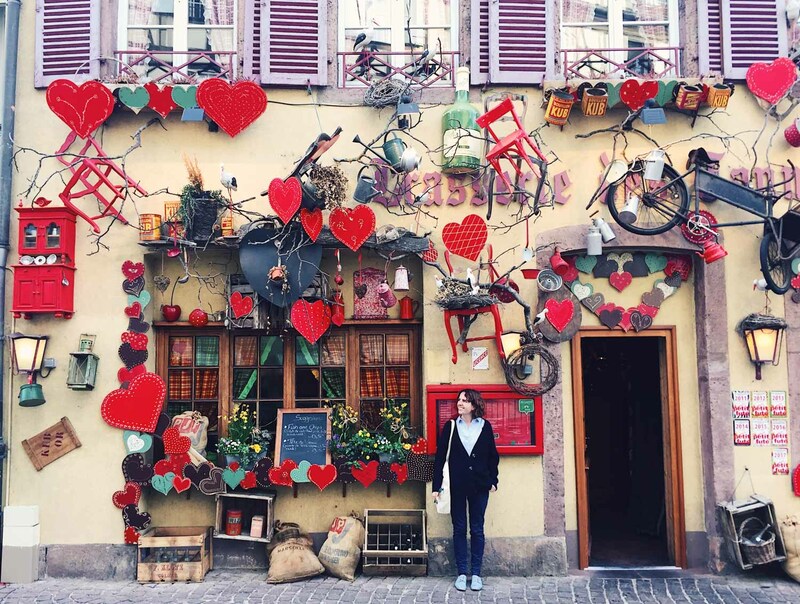 A characterful, well-designed hotel in the centre of Colmar. Rooms start at €79. Find the latest prices and book now. A charming and beautifully designed bed and breakfast with plentiful social areas, including a home cinema and pool room. Room start at €80 .Find the latest prices and book now. 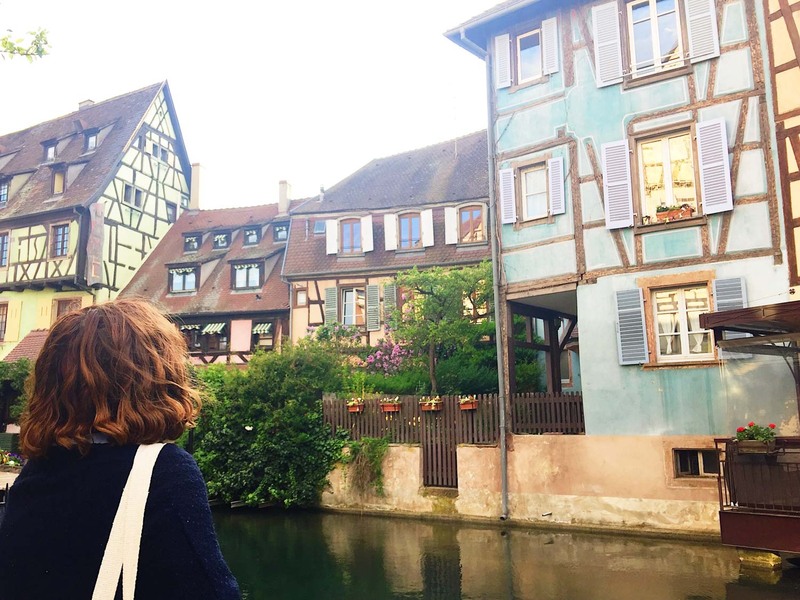 For the ultimate in Colmar charm, stay in Little Venice at Le Colombier, home to the best views in town. Rooms start at €110. Find the latest prices and book now. 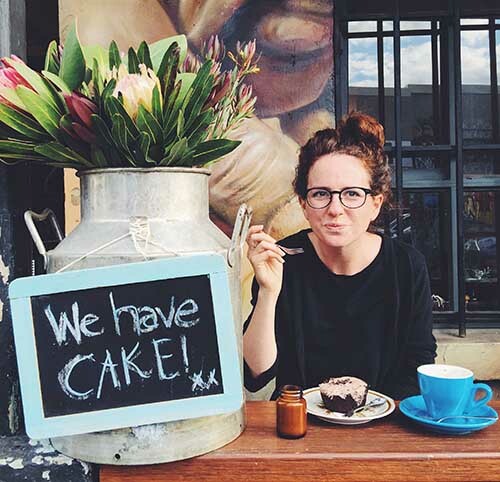 A simple and popular option close to the train station. Breakfast is included. Rooms start at €50. Find the latest prices and book now. 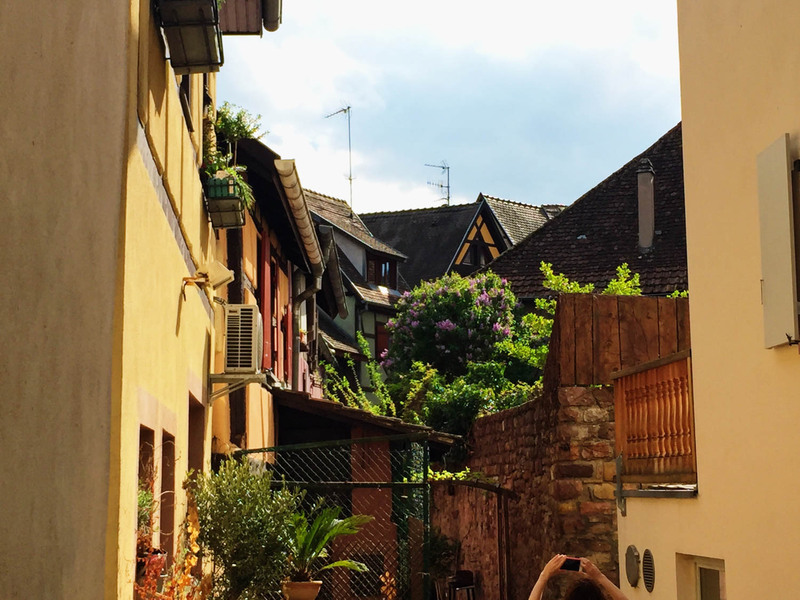 We stayed in an AirBnB apartment in Colmar, just outside the old town, which cost £40 per night. The specific one we booked isn’t available at the moment, but there are plenty of others available and if you book using this link, you’ll get $25 off your first booking. 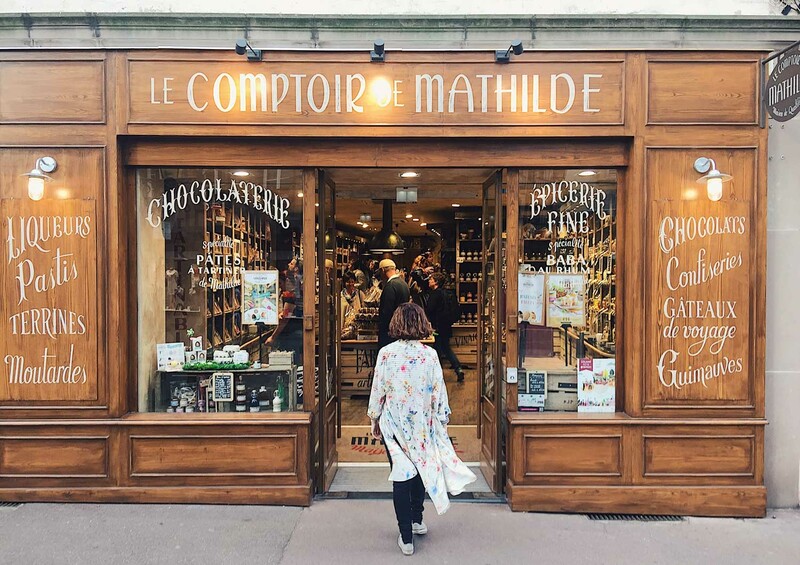 France isn’t a great place for vegetarians, but we did find a couple of good options. One was the cute L’Un des Sens wine bar, recommended by Simon and Erin. 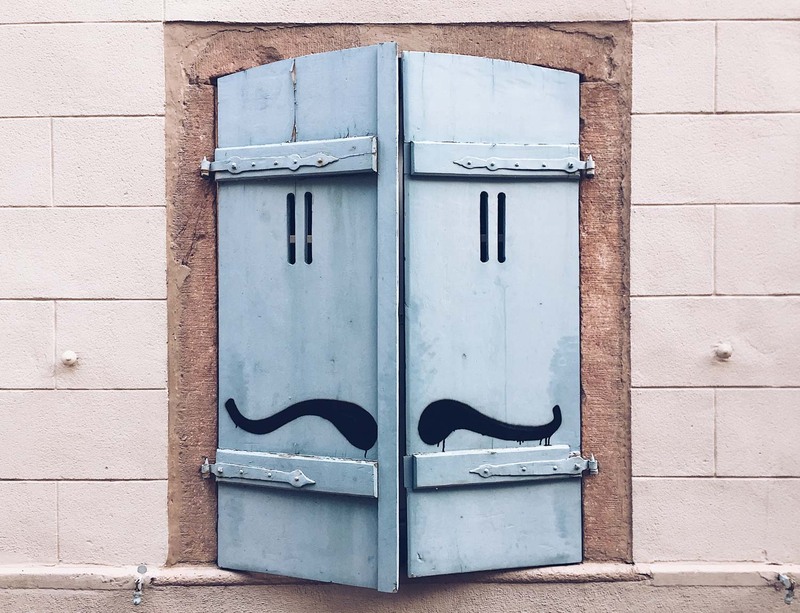 In an atmospheric position, set back from the street at 18 Rue Berthe Molly, the bar’s licence means you have to order a small snack with your drink and they had a great selection of veggie dips, cheese and bread. We also enjoyed a lunch in the garden of L’Arpege organic restaurant, which has a daily set lunch menu, including veggie options. I also recommend eating lunch at the covered market and trying to get a canalside table outdoors. We flew to Basel from Bristol and caught the Flixbus from Basel airport to Colmar, which took 1 hour 20 minutes, and cost €12. 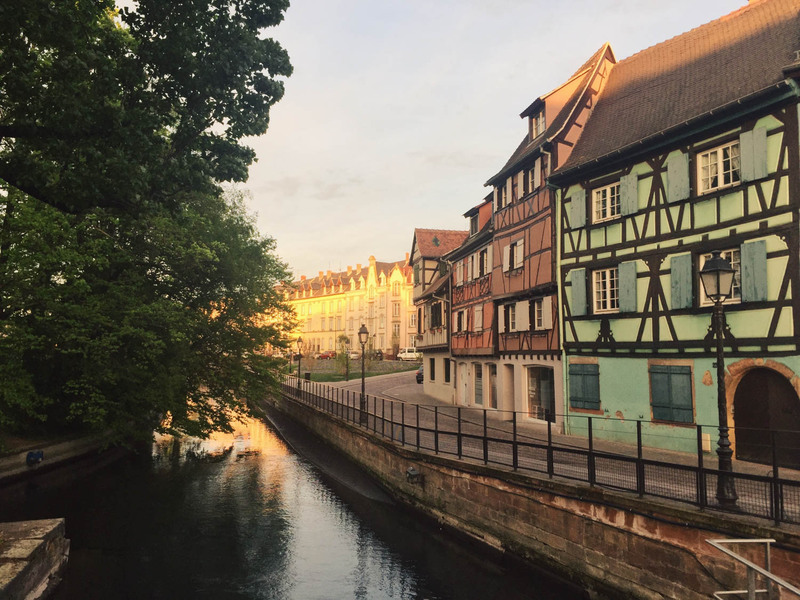 Colmar is also just 2 hours 20 minutes from Paris by TGV train (there are some direct routes, butmost require a chnage in Strasbourg). Before leaving Colmar and heading off on the rest of our road trip, we hired a car from Hertz via Rentalcars.com. We have always found the cheapest offers on this site. To get to Eguisheim, we rented bikes from Colmar Velo, which is right next to the train station entrance. We got hybrid bikes, which cost €12 for half a day (€20 for a whole day). A city bike is slightly cheaper at €6 for a half day and €8 for a full day. You need ID to rent the bike and also need to put down a deposit of €75 per bike, which we paid by card. They provide maps of routes to different towns. Thank you! It was so picturesque! Thanks Racehel. It definitely is a very picturesque part of the world! The amazing….i hope someday i want come to here……i am nandar from Indonensia….nice to meet to you…..
We’re going to share it on our facebook page soon ! 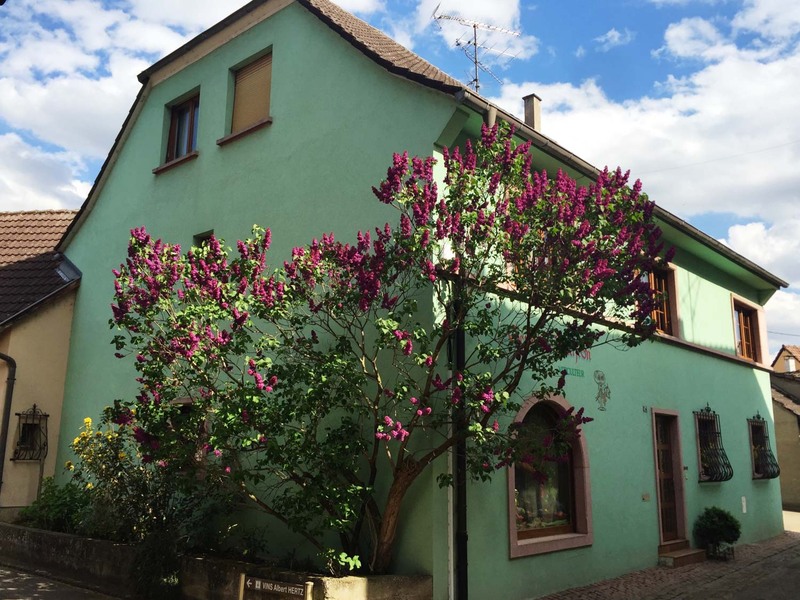 That green house along the Quai de la Poissonnerie in Colmar (n. 23)… My friend used to live there and we would play table tennis there after school. 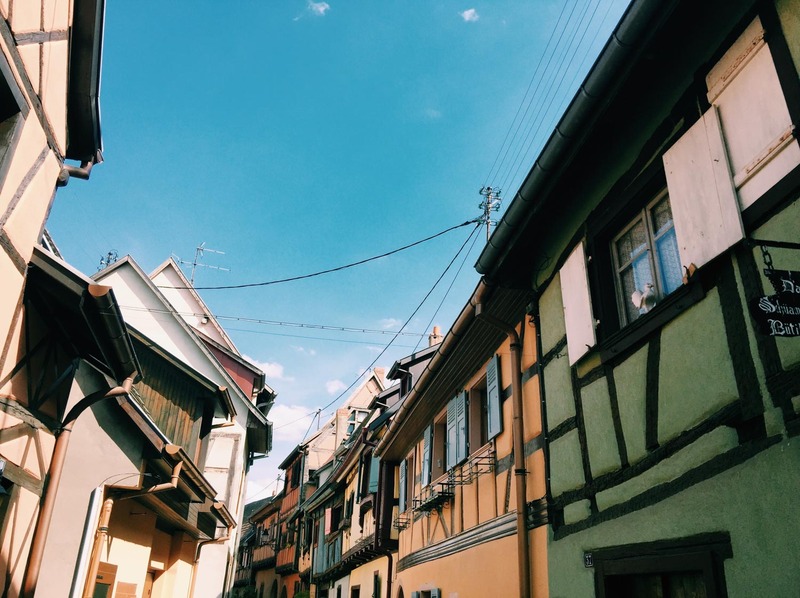 I was born in Colmar and it always makes me happy to see positive comments from tourists and travellers. 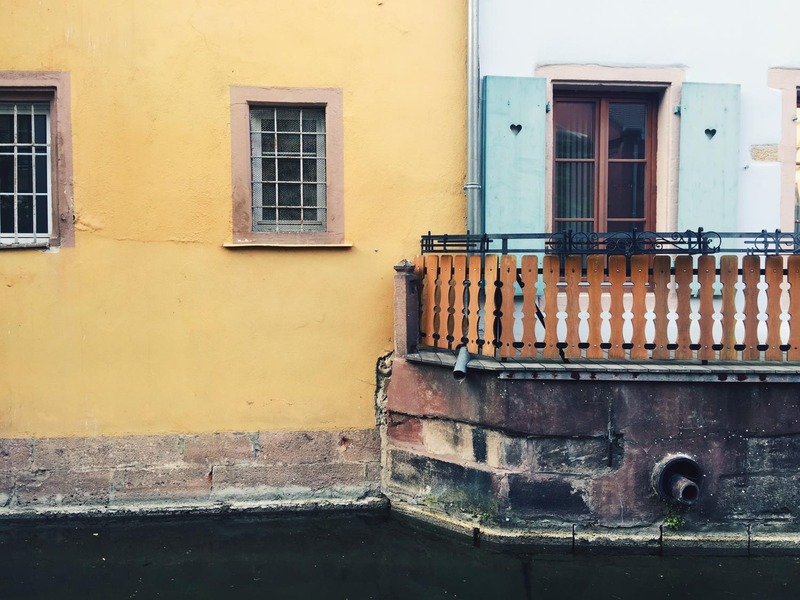 Alsace really is a beautiful region and I am very fortunate to have been born and raised here. 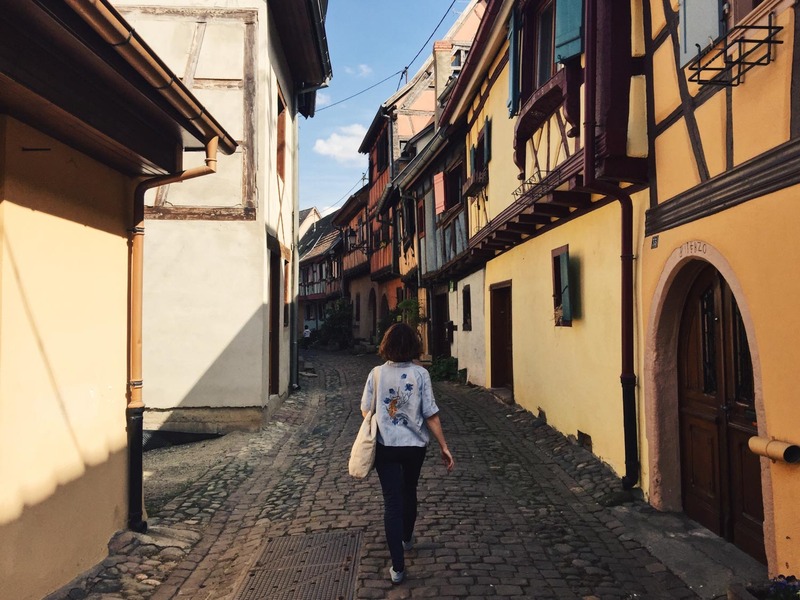 Thank you for sharing your beautiful pictures and for taking the time to talk about Colmar and Eguisheim in your blog. That’s wonderful that you recognise the house! It really is a gorgeous place. Lucky you to grow up there! 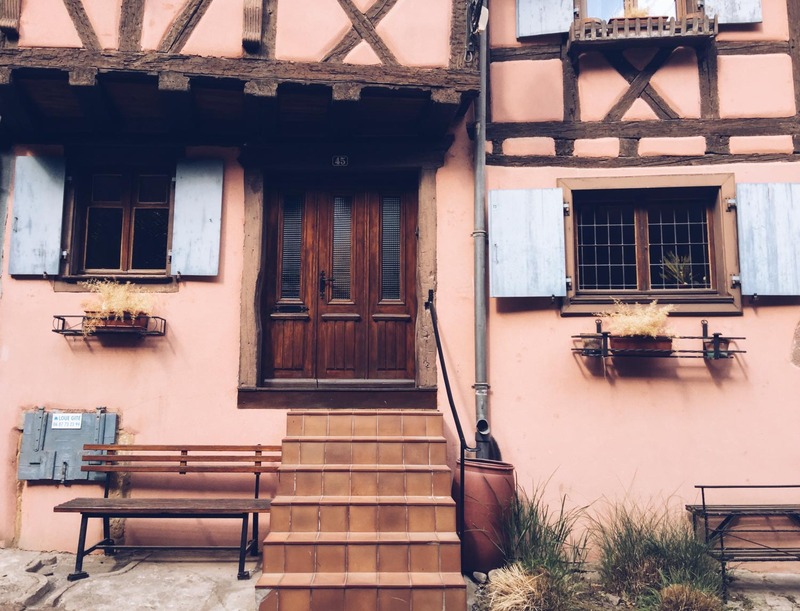 I live in Colmar and for me it is not a fairy tale but a nightmare. The people here is awful : racist, nacionalist, lazy, disrespectfull. I don’t have the impression to live in France. I’m fed up to hear German & Alsacian all day long. It is just a place for tourists not to live. We left our apartment because of the neighbors who ruined the life to us. In the second appartment it is hell too. When we go to the polling station, we have reflections on our family names. Our name is not “alsacian” … I feel like a stranger in own country. The real-estate agents, the removal men and the owners are all swindlers. I’m fed up to enrich these people there ! This region gives me the nausea, I wait only for a thing : leave !